Sudan on the Verge of War? This post originally appeared on the security blog at Think Progress. Achol’s face and neck were dotted with white burns from the sparks of a cluster bomb. Her daughter, one-year-old Nyibach, suffered from the same painful sores. Achol’s family, which includes four other children who went missing in the chaos of the recent attack, is from Abyei, the hotly contested region on Sudan’s North-South border. Deploying Antonov planes and fighter jets, ground troops, tanks, and government-aligned militias, the Sudanese government’s military offensive late last month in Abyei displaced upwards of 100,000 people. 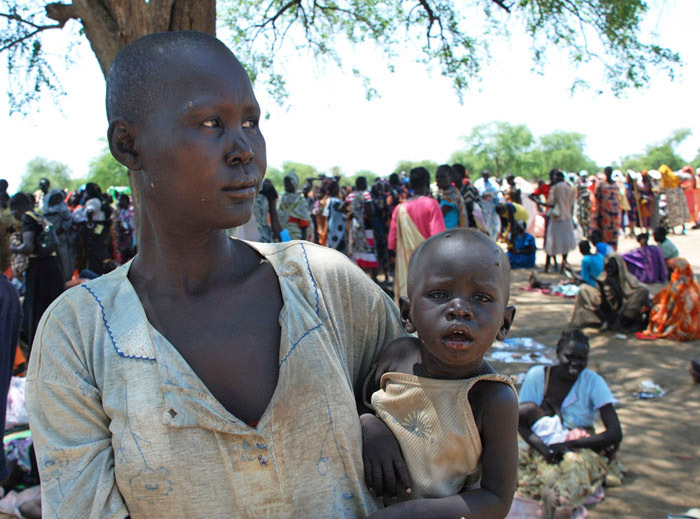 Abyei’s leaders, themselves displaced along with the majority of the area’s Ngok Dinka residents, estimated that 116 civilians were killed, but the death toll is difficult to determine because the government has restricted access. But casualties like Achol and Nyibach aren’t simply “collateral damage” of a confrontation between the northern and southern armies. According to an internal U.N. memo, the ethnic make-up of the displaced, and accounts by those who fled, indicate a campaign by the Sudanese government to deliberately target civilians, with the aim of depopulating the Abyei area of residents that identify as southerners. No sooner had the situation in Abyei tenuously stabilized -– with the northern and southern armies facing each other on either side of the river and tens of thousands of displaced southerners receiving aid – when fighting broke out just north of Abyei in Southern Kordofan, the North’s only oil-producing state. The military confrontation reportedly arose from a disarmament campaign gone afoul. But violence has now engulfed most of the state, prompting President Obama to issue an audio statement calling for an immediate ceasefire. With South Sudan’s independence from the North just weeks away, the northern government led by President Omar al-Bashir, notorious for its targeting of civilians based on ethnicity and use of local militias to flame local tensions, seems set on destabilizing the border area in a last-ditch effort to back the southern government into a wall. Diplomats have been clear that the recent violence won’t derail the South’s secession, but much is still at stake in negotiations between the two sides over arrangements on combustible issues such as oil, citizenship, debt, and boundaries, including the status of Abyei. Reports mount daily of atrocities carried out against civilians from the Nuba Mountains, northerners who sided with the South during the civil war. In addition to aerial bombardments -– often with rudimentary explosives made of oil drums pushed out the back of Antonovs –- government-aligned militias are reportedly going door-to-door abducting or executing people sympathetic to the South’s ruling party. In one particularly harrowing account, a U.N. security report described smuggling out Sudanese staff in commercial vehicles because the northern army wasn’t allowing them to be evacuated. Analysts, including those at Enough, have long warned that Abyei and the tensions in Sudan’s border states could reignite war between the North and South. But until recently, it looked as though the rival governments had concluded that a return to war was not in their interest. Now, the ferocity of the violence and the targeting of civilians in Abyei and Southern Kordofan force a re-evaluation of that assumption. As the purely rhetorical international response to Abyei proved, public shaming of Bashir’s government accomplishes nothing. But contrary to the belief voiced quietly in diplomatic circles that the Obama administration has used up what influence it had in Sudan, there is more the United States could do to demonstrate to Bashir’s government that there are consequences for targeting its own civilians. A statement by the Enough Project and partners at Sudan Now issued today outlines some of the specific actions the U.S. should take to pressure the Sudanese government to step back from a full-out war.